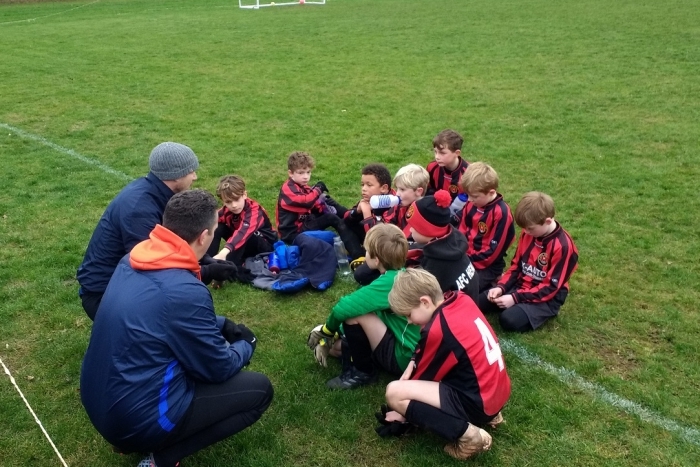 Following on from their first match, the Henley AFC U9 Hurricanes are gradually finding their feet for the unfamiliar challenge of a higher division. The morning was typical for mid January with the occasional spot of rain falling from the cold, grey sky. A number of home games for AFC Henley left the Jubilee ground buzzing with activity, which led to some slight confusion for the away team as they arrived on pitch with minutes to spare. The Hurricanes made a good start with Freddy Estornel kicking off, joining with Corben Galloway for some early pressure. This attack was pushed out for a corner, but then worked back into the visitors area, culminating in a sweeping shot from Archie Butlin passing just wide of the post. The Raiders came back with a goal kick, pushing well into the Henley end, but Charlie Myers and Charlie Cooper displayed some super defensive skill to keep the threat at bay. The home team kept up their consistent commitment as Lorenzo Nicoletti-Dowd dribbled expertly past the opposition, playing a through ball on to Corben who crossed in to Charlie Myers for a shot on goal forcing the keeper to make a save and win a corner. 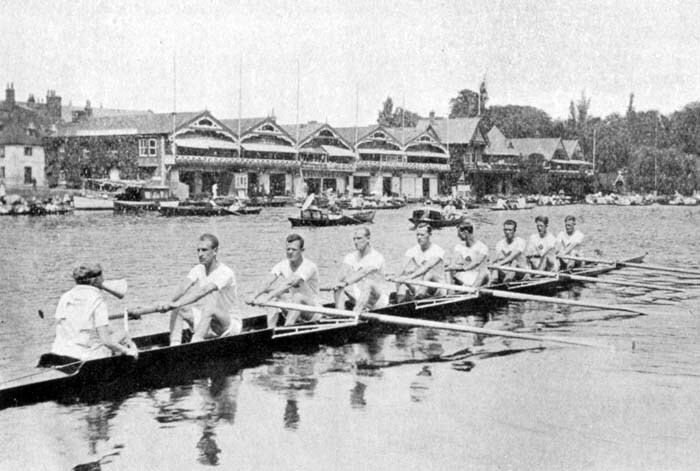 The blues began their fight back with a wave of pressure into the Henley end, this saw one shot sailing over the bar, not troubling keeper George Beesley. 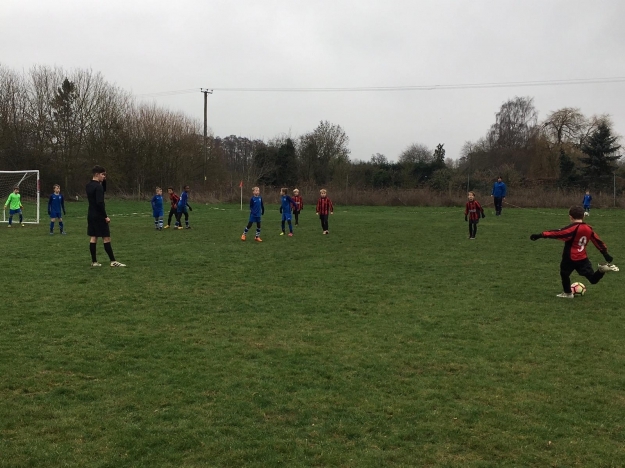 However George also got to display some magnificent ability as he made several diving saves and collected the ball and cleared it confidently when required. Towards the end of the first quarter, Freddy passed on to Charlie Cooper with a long shot going just grazing bar to leave the score at 0-0. With some fresh legs coming onto the field Theo Decardi-Nelson began with one of many great runs down the right hand wing, crossing the ball well into the Hawley area for striker Freddy. As the scoreline suggested, the match was playing out fairly evenly with the Raiders defending strongly, one tackle saw midfielder Isaac Walmsley injured, needing to take a short time out to recover. 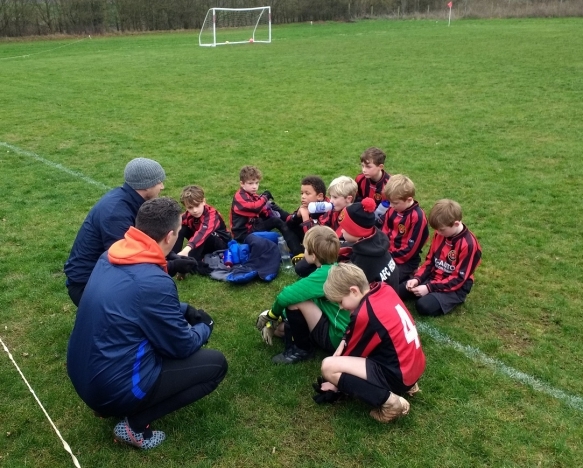 However, back on the pitch this didn’t appear to adversely affect him as he went on to play some super football, winning tackles and feeding the ball well up to the opposition end. Lorenzo continued to play superbly, winning the ball and passing on to Isey for a one two, then with a through ball to Freddy who finished with a lovely left footed shot on goal rolling just wide of the post. Harry Biggs also played a commanding role in midfield neutralizing the blues attacks and working well with Lorenzo and Isey. The home team were now putting Hawley under pressure and beginning to look more in control. Harry with a great tackle in his own half, running well with the ball into the Hawley end and taking a worthy attempt on goal from distance which arched narrowly over the bar. When the visitors were able to mount an attack Charlie Cooper performed several strong tackles and some great defensive work. Theo also continued to display some great attacking football along the right wing, outplaying his opposite number on several occasions. As the end of the first half approached the home team conceded a corner, this was hoofed into the box, well headed by a defender, but unfortunately the ball found its way into the net for an own goal. Unconcerned by going behind, Henley started the second half strongly, Charlie Myers curled a good shot on goal, glancing the post and going out for a goal kick. At the other end, George also worked hard with some more admirable saves, collecting the ball comfortably. The visitors kept up their pressure but Archie countered with some super defending. Unfortunately one contest resulted in Archie being met with a heavy tackle and an injury to his foot, this led to Harry Biggs being brought back on to replace him. The game continued with Corben passing to Lorenzo, then on to Freddy for another shot on goal, just shaving the crossbar. Both teams working hard and Hawley with a powerful shot, was met with another great save from George. Well into the match Henley were under pressure to pull something back, with Corben making a good tackle to win the ball from a Hawley player, he quickly dribbled down the left wing then passed into the centre for Freddy. Freddy then took it past two blues players and finished with a great shot to score for the Hurricanes. A well earned equaliser at the end of the quarter. Having lost their advantage, Hawley raised an early attack resulting in another fantastic save from George. Lorenzo guided the ball from his own half up to Isaac on the left hand side, Isey performed some great footwork to sidestep the midfielder and cross in to Freddy who quickly turned with a shot on goal, going just around the outside of the post. Charlie Cooper blocked another attack, defending strongly then delivering out to Theo on the right. Theo dribbled the ball well into the opposition half, then unleashed a great shot on goal, unfortunately sailing just over the bar. The Raiders were now becoming more determined, building pressure on the home side, making a shot on goal, which was well saved by George, but finding the ball at his feet another Hawley player pushed it over the line for their second goal. With the end of the game closing in, the Hurricanes stepped up their play once again. Harry, winning the ball, passed out to Theo, neatly delivering back in to Harry who crossed it in to Freddy for a lovely left footed volley into the opposition goal. Much to the joy and relief of the home crowd, this ended the match level. The game was hard fought and well played by both teams, with the Hurricanes looking to have the upper hand, manager Mark and coach Ryan can be proud of a super team effort.